On Oolong Island, the Doom Patrol continues to battle some weird, extra-dimensional animal species, as seen last issue. Batman breaks into a science lab nearby and takes out a couple of employees, security guards perhaps, with well-aimed batarangs. Man-Bat is on the loose (or a creature who looks just like Man-Bat), and Batman takes him down with the help of some toxic substance in an aerosol can from his utility belt. Batman speaks to a grateful employee, and asks for "the emotion-controlling mask of the Psycho-Pirate," which they have in secure storage. Batman hopes to use this mask to help stop the Starro invasion. At The 99 Steps Foundation in Spain, Jabbar the Powerful, Noora the Light, and Jami the Assembler react to the explosion that we saw at the end of last issue. They indicate that it was Firestorm who blew up. We see that Firestorm has expelled Ron Raymond from the Firestorm matrix. Atom and Flash remind everybody that Firestorm is a composite being; and that Ron is half of that composite. Jason Rusch is the other half. Suddenly, Hadya the Guide, Darr the Afflicter, and Bari the Healer seem to disappear. In fact, they are drawn into the Firestorm matrix, so that for the first time, Firestorm is composed of four people. We are told that feedback from some equipment that Jami was using caused the expulsion of Ron Raymond and the inclusion of Hadya, Darr, and Bari into the Firestorm matrix. Jason tries to calm the three new members, since the matrix can be disorienting; but Darr panics, and his pain powers cause Jason some discomfort. Jason indicates that the Noor Stones are reacting with Firestorm's energy field, and causing the feedback loop. Hadya decides to use her tracking powers to locate the source of the strange Noor Stone energy. Of course this means that Firestorm, including all four heroes inside the matrix, go along for the ride. Flash and Atom, along with Jabbar the Powerful and Noora the Light, watch as Firestorm speeds off into the distance. Atom and Flash decide to run some tests on Dr. Light and Green Lantern (John Stewart) to figure out how Starro gained control of them. As they all walk off, Jabbar candidly admits that he did not understand a single thing that just happened. At the City of the Future, Samda the Invulnerable uses her power to create a force field, protecting Wonder Woman, Lucius Fox, Batina the Hidden, and Dr. Ramzi from the angry mob so that they can work on a solution to the mechanical enclosure that has sealed off the city. Batina uses her power to reveal hidden encrypted files in the computer system that indicate that Mamluk International is the source of the metal enclosure. Dr. Ramzi expresses his disappointment with company owner Rughal. Further examination of the secret files reveals that Mamluk International is up to much more: massive secret construction projects, and smuggling of illicit weapons systems. Sami the Listener tells Dr. Ramzi that he hears something. A discussion is going on inside the Firestorm matrix. Darr the Afflicter has some neural damage as a result of the fusion inside the matrix. But Bari the Healer is focusing his healing power on Darr to heal him and calm him down. Jason indicates that the Firestorm matrix is not designed to hold four people; and that the presence of the four of them is causing the matrix to overload. Jason says that somebody needs to "drive" (take control of the Firestorm entity); and that he cannot do it, for reasons too complicated to explain. Darr says he can do it, as long as Bari keeps focusing his healing power on Darr. They agree to this arrangement. Firestorm flies near the Atlantic shore in Brazil, still following Hadya's guidance. His energy glow makes him easily visible from the beach below; but the people watching do not realize that they are observing four heroes inside of one. Darr indicates that after years of being wheelchair-bound, he is thrilled to fly. But the other heroes tell him to focus, and to go where Hadya is leading them; the source of the strange Noor Stone energy. Hawkman is also in Brazil, along with several members of The 99. The newest holder of a Noor Stone is causing the earthquakes with his power, and is unable to stop, as we saw last issue. Hawkman jumps in to attack the earthquake guy; but Mumita the Destroyer tells him to stop; saying that some problems cannot be solved just by hitting them. Hawkman persists in his desire to the knock the young man out to stop the earthquakes; but finally defers to the members of The 99 who are present: Rafie the Lifter, Fattah the Opener, and Mumita the Destroyer. Rafie proposes a triad link; but Mumita worries that they do not have the right combination of powers for this task. The young man who is making the earthquakes is continuing to struggle to control his power; and Hawkman says that the entire South American continent is in jeopardy. Hawkman is preparing to attack with his mace when Firestorm arrives. 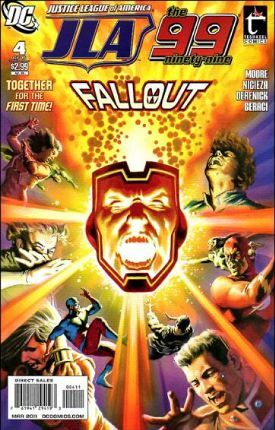 Firestorm explains that members of The 99 are inside the matrix, and that Darr the Afflicter is currently in control of the Firestorm entity. Mumita says that Bari, Darr, and Rafie should make up the triad, because that is the right mix of powers. In response, Firestorm ejects Bari and Darr. Now, Hadya and Jason are inside the Firestorm matrix, with Hadya in the driver's seat. The three members of the triad work together to remove a tiny Starro that has attached to the neck of the earthquake guy; while also healing him and reducing his pain. With the Starro removed, the young man can think clearly again. Hawkman, being cynical, asks if they will need to heal every infected member of the planet, one at a time, using this same technique. Back at The 99 Steps Foundation, they are tending to the injured from the Firestorm explosion. Flash has already taken the worst of the injured to a nearby hospital. Atom and Jami are scanning Dr. Light, Green Lantern, and a couple of civilians; to see if they can break the Starros' symbiotic bond with their hosts. They are not having much luck. But then Batman shows up, wearing the Psycho-Pirate mask; and says he will use it to control the violent behavior of the masses. We head back to the City of the Future, and learn what Sami the Listener heard; the construction of a giant mechanical Starro. Story - 4: You know, this series is starting to grow on me! This was a big improvement from last issue. The story flowed better. Many of the story details really made sense this time around. We know that members of The 99 need to work in groups of three, called triads, to use their powers effectively. I thought the triads this issue were well thought out and logical for the problems they were confronted with. I loved the scene with Firestorm. I found the notion of Ron Raymond being expelled from the Firestorm matrix and three members of The 99 being sucked in, to be quite a novel and interesting idea. And it was handled well. The three members of The 99 caught up in the Firestorm matrix showed just the right blend of surprise, awe, and confusion. You have to admit, if you are unfamiliar with the whole Firestorm thing, the only DC hero who is a synthesis of two people; it can be quite perplexing. Kudos to Jabbar the Powerful who watched the changes to Firestorm, and was honest enough to admit that he didn't have a clue what had just happened. I liked that Darr the Afflicter, who is confined to a wheelchair, got to fly as Firestorm. He was very excited, as I know anybody in his situation would be. I really liked that Bari the Healer used his healing power to allow Darr to have that experience. This display of unselfishness, compassion, and teamwork is what The 99 is all about! When Hawkman wanted to use his mace to knock out the earthquake guy, I actually thought this portrayal of Hawkman was pretty accurate. Hawkman always struck me as a rather callous and headstrong hero who would settle for tough solutions when he felt it was necessary. Those who recall Brad Meltzer's outstanding series "Identity Crisis" from several years back may know why I say this about Hawkman. His sarcastic comment here about "flowers and poetry" seems very much in character to me. All around, this issue exceeded my expectations and was a pleasant surprise. Art - 3: The artwork seemed to improve this issue as well. Although the style is still a bit too cartoony for me, there were several images that I liked: Firestorm in flight, Hawkman looking stubborn and angry, a close-up of Flash looking pensive, and Batman wearing the mask of the Psycho-Pirate. Cover Art - 3: Felipe Massafera does a pretty nice job once again. We see Firestorm's face in the center of the image, emitting energy beams in all directions like spokes on a wheel, sort of dividing the image up into "pie slices". Heroes from the JLA and The 99 appear to be victimized by this onslaught of Firestorm energy. The heroes are drawn with that look of Felipe Massafera realism that is reminiscent of Alex Ross, in my opinion.